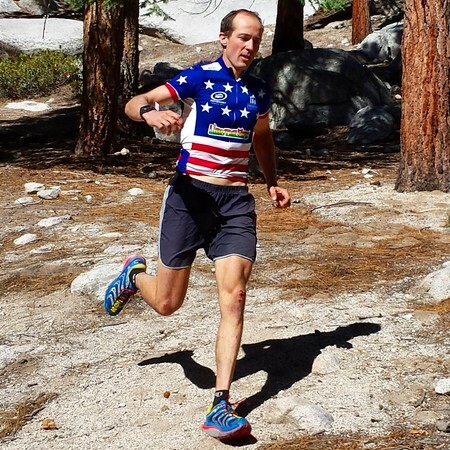 Here's a new log from Strava (bicycling app that logs trips), showing Matt Dubberley with an ascent in 1:47:40, and car-to-car in 2:38:15 via the Mountaineer's Route on August 2, 2015. Wow! Is that the correct elevation - 5,932? Wow, 50 minutes descending?! That's amazing, even more impressive than the ascent time. Liked reading his account and his frankness. I didn't know there was so much competition about holding these types of records and how much it means to them. I'm trying to picture anyone flying down that steep, rocky section between LBSL and the first creek crossing at the speed his splits show. Just can't imagine it. His balance must be damn near perfect. 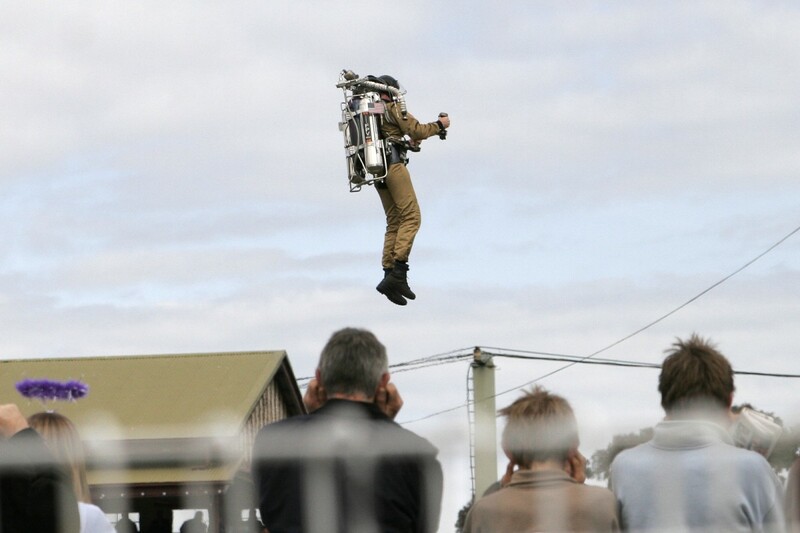 I wonder if anyone was on the E-ledges when he came flying by? That would be a real pants-filler at a couple of points where there's barely room for one person, having someone suddenly show up on your tail out of nowhere. Maybe I missed it, but I don't recall him mentioning a permit . . . Round it up to 3 hours (rest up, beer), divide into 24 and you get 8. Dave, after a multi-year layover in Hawaii, sierragator is again prowling the Sierra. Jimbo moved back to the mainland a few weeks ago (Reno) and is attacking the mountains as if someone might take them away soon. Who knows . . . The second photo in the trip description shows a "shortcut" above LBSL. Can someone describe this shortcut. It looks like it bypasses Clyde Meadows by heading up the cliffs to the left of the MR above LBSL. Wow, that was exciting to read. I wish I knew what it felt like to be in such great physical condition. I would love to be able to run as fast as he does with such great confidence and sure footing....it must feel almost like flying, he's got to be super light on his feet. I'm stunned by this achievement. Next time he should do it with a backpack, I would love to know how fast he can move with a 20 lb pack. Here's that picture. Need to check it out on a map. I downloaded his Strava gpx file, and set it up to display on Gmap4. Click here for a separate tab page or window. Note that his gps threw a number of bogus locations near the Notch. Makes it appear that he climbed the summit several times. As for the alternate route that he was considering above Lower Boy Scout lake, (and did not take on this track), I really don't think it would make any difference in distance. Just below Iceberg Lake, he used the tougher seep climb on the way up, and on the way down followed the easier route a bit west of the seep. If you switch to the satellite view and zoom in, you can see it pretty well. Frank, here's a view you should recognize, taken from LBSL. The slabs are on the right. Just a couple of weeks ago Joe Q and I were talking about this very same thing as an alternate approach to UBSL when a couple of guys showed up at LBSL. 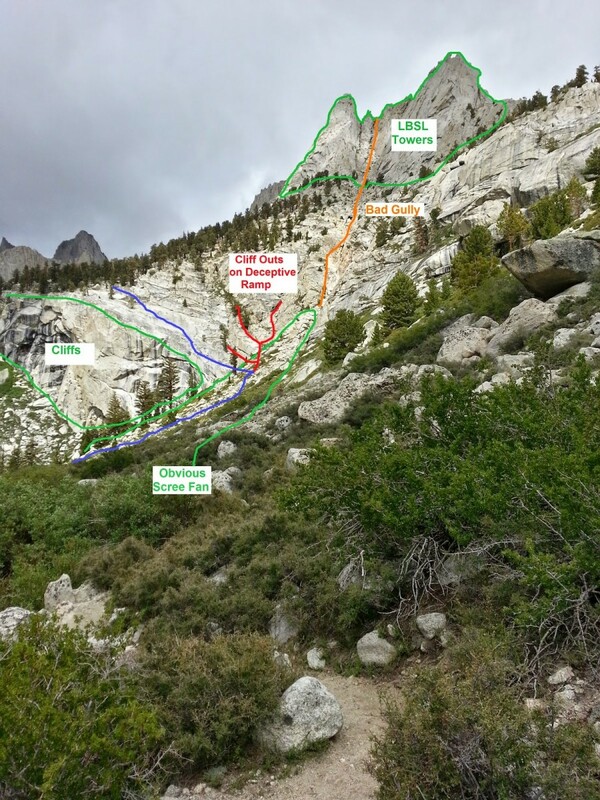 They mentioned they had taken this route before, the primary reason being to avoid the scree on the normal route to the left and around the boulders. They said the slabs themselves weren't too bad, but that getting to them was actually a tougher job. Like many things, the slab route isn't too difficult if you know where to go. I took this variation once a year or two back. 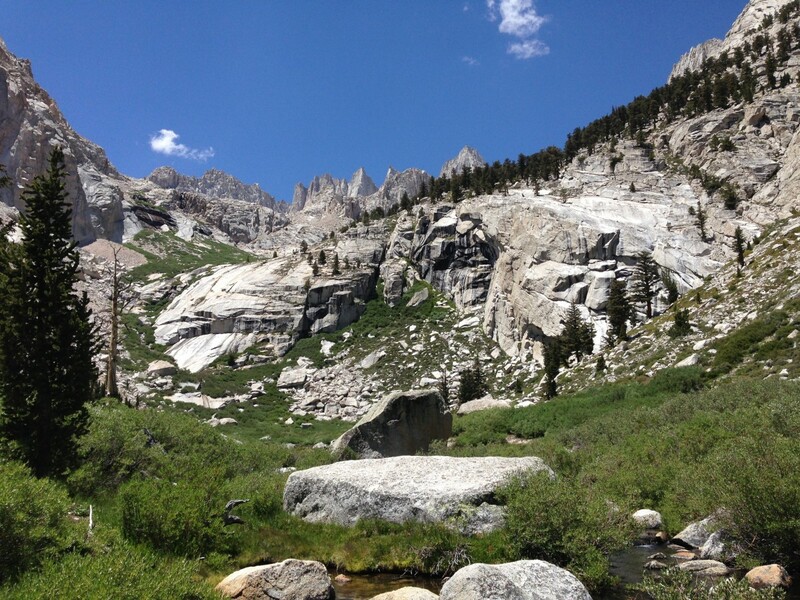 Once you top out the N. Fork gully and near LBSL, instead of following the use trail to the outlet of LBSL, stay a little higher and you can pass around or above the willows that plague the lake shores. From here you cross the obvious scree fan (note in pic) and join the slab route above the obvious cliffs at the lowest point of the major slab (the route in blue). It SEEMS like there are two or more ways to join the slab higher up (a little further from the cliffs), but those routes cliff out (red routes). Ultimately, this is a nice way to shake up the MR if you feel so inclined, but with the well-worn and apparent nature of the MR, following the route south of LBSL is significantly faster IMO. I am under the general impression that SB's blue route offers a more direct path (with less sand) to Mt. Russell. Snacking Bear, I think you tried this in the past? Yes. But it's a bigger hill. Taking the slab alternate puts you at the foot of Carillon quicker, and at a lower elevation. So, technically you have a bigger direct climb. After making it up Russell via Rockwell, I'm going to say that taking the MR to UBSL saves time because the route is clear, and broken in. It is also longer, and equates to a less aggressive incline. Here is an image of Carillon/Russell Col and Carillon SE face. If you see the route in blue, is much more elevation gain than the classic slog in red. 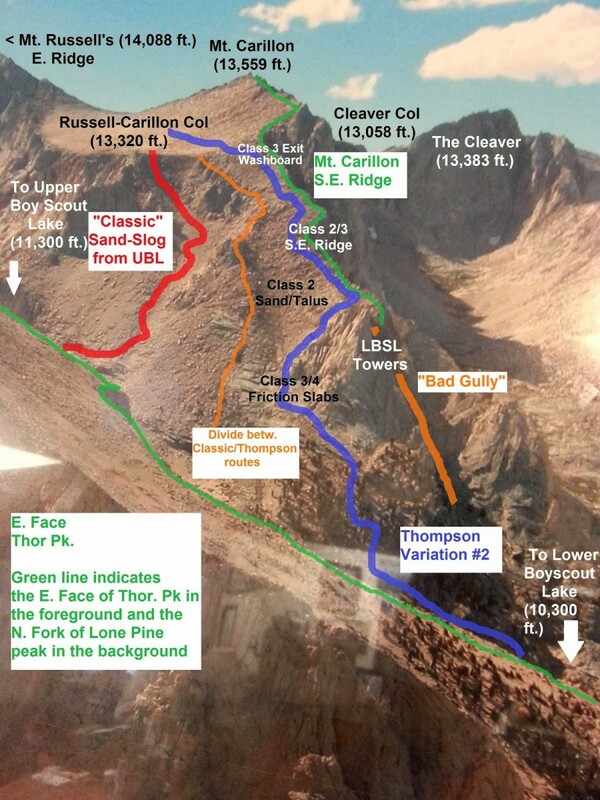 I'd almost recommend getting to UBSL and then cutting eastward past the red route and following the rocky rib (orange line) up to the Col. Generated in 0.073 seconds in which 0.063 seconds were spent on a total of 14 queries. Zlib compression disabled.